Kebab, another World Hit from the Middle Eastern cuisine, is in the favorite list of most non vegetarians around the world. Kebab has its origin in the Middle East, and over time has spread to various corners of earth. Over time it has made its strong presence all over Asia, Northern Africa, Eastern Europe. It is a simple dish, originally an Arabic food. It is just a chunk/steak of grilled meat, in varying shapes. Though the authentic Kebab would be of mutton or lamb, the meat can be beef, chicken and fish as well. Most of the dishes varieties are cooked using a Skewer, also known as Seekh in many languages such as Urdu. However, several of them are not. No matter what the type is, for a Kebab to be of good standard, the first criteria is to not have any remains of bone. The more soft, succulent and tender the meat steak is, the better the preparation is. The famous and widely used Urdu/Hindi phrase of ‘Kebab mein haddi’, which literally means bone in the kebab, is used metaphorically to taunt an unwanted person or a hurdle in a circumstance. Kebab is believed to be originally an Arabic food, owing to the fact that the word Kabab in Arabic means roasted slice of meat. However, some believe that it originated in Iran and Turkey, in the Medieval period. More so, because of the traces of stone supports for the Skewers and remains of burnt animal bones. These areas had scantiness of vegetation. That meant fuel to cook was also very limited in that period. So, this cooking style using a Skewer meant less usage of wood. Another story of origin is associated with the Ottoman Empire. The Ottoman empire soldiers used to roast meat of hunted animals with their swords and other sharp weapons. The Kebab has its mention, in ancient cook books and texts such as Kitab al-Tabikh and Kyssa-i Yusuf. In the West this dish is called Shish Kebab and also Shashlik. Another popular name around the world is Doner Kebab, which has its origin in Turkey. 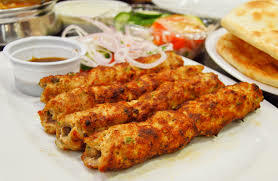 In the Indian sub-continent it has a generic name Seekh Kebab, because the skewer is called Seekh in Urdu and Hindi. Shish: Originated from and associated with Arabia. At present in the Americas this is the most variety and name to address the dish. Doner Kebab: Doner is from Turkey. It is prepared by grilling the steak of meat in a rotating spit. Suya: This variety is from the western part of the African continent. This variety is very spicy in taste. Sosatie: In South Africa Sosatie is a very old dish, which is a form of the Kebab. Chapli: The name Chapli originates from the word Chaprikh, meaning flat. Just like its name, the shape is flat as well. It is ate with Naan, a type of bread in the North west frontier of the Indian sub-continent. Kathi: A variety from the east of the Indian subcontinent. In Bangladesh, this variety is mainly beef just like other Kebabs in Bangladesh. Whereas, this side of the border, in India, it is chicken and mutton. Chuanr: This variety is from the land of China. It originated in the Muslim populated Xinjiang province and has spread throughout the country over time. Pork: A niche variety. Not found in Muslim dominated regions, for religion related prohibition. An Indian type of this variety is Soovar ki Saanth, popular in the North western part. Paneer, Potato, Soya: These are various types of the vegetarian variety. India is the home to these varieties. These varieties originated because a large part of India’s population has been vegetarian. Burrah: Another variety of this remarkable dish from India, prepared with goat or lamb meat. The dish is marinated and grilled in charcoal.